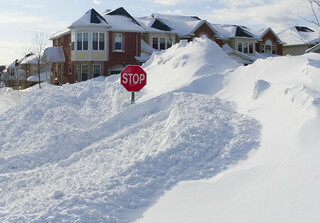 Full height STOP sign buried after a 50 centimeter snow fall. Despite the title of this photo, I love winter, especially when it snows a lot. Just a bit of humour! This image is part of the Red Cross 2009 Calendar to raise funds for the Red Cross National Disaster Relief Funds.